I was sent a copy of DIY Projects for Cats and Dogs by Fox Chapel Publishing. It is full of really cute projects to build for your favorite furry family member. My DIY skillz are limited to simple things like the Cat Cave I made for the Farm Cats. But this book has given me some great ideas for projects for the hubby. Hahahahaha. Read on to learn all about it. Pamper your pet while you save money by doing it yourself! This book shows you how to build inexpensive, functional accessories to make your home a pet paradise. DIY Projects for Cats and Dogs presents 20 simple projects that you can make in just a weekend, without any advanced skills or special tools. From a cat tree and a hide-away litter box to bowl stands, leash racks, and a Scandinavian bed platform, these stylish structures will take care of your pet’s needs while preserving your interior décor. Built and pet-tested by the authors in their own home, each imaginative creation features step-by-step instructions, materials lists, and inspirational color photographs. Functional yet stylish furniture and accessories to make for your cat or dog. 20 simple DIY projects that anyone can make in one weekend without special skills. Save money by doing it yourself with scrap wood, simple materials, and basic tools. Modern, decorative designs let you show your love for your animals while embellishing your home. Step-by-step instructions, materials lists, and inspirational color photographs. Projects include litter boxes, dog house, bowl stands, bed platforms, travel basket, cat tree, leash rack, bedside table cabin, and more. Armelle Rau is Communication Manager at the Scandinavian decorating group Søtrene Grene West. Armelle writes a fashion and decoration blog, Mocassin Headband (http://www.mocassinserretete.com). She lives in France. 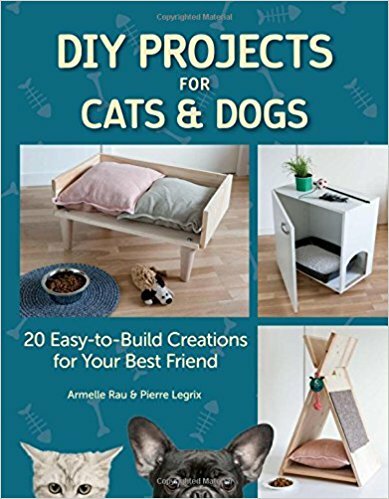 One lucky US reader will win a copy of DIY Project for Cats and Dogs. Just enter as many ways as you would like on the Gleam widget below. Good luck everyone.